International aerospace company Airbus is the subject of two new 3D printing announcements this week. In the first instance, Swiss OEM Liebherr-Aerospace is to start supplying serial produced 3D printed parts for the Airbus A350 XWB. In a second, but separate announcement, Dutch 3D printer OEM Ultimaker is to provide machines and Ultimaker Cura software to Airbus facilities in Europe. Both announcements build on existing partnerships between the companies and the leading aerospace provider, and add to a growing roster of Airbus additive manufacturing initiatives. Since fall 2017, Liebherr-Aerospace Lindenberg has been authorized by the German Federal Aviation Office to produce flight-ready components using additive manufacturing. Currently, its expertise covers the processing of class 2 and 3 titanium alloys for end use airplane parts. In April 2017 Liebherr, in collaboration with Chemnitz University of Technology, Germany, developed and trialed a metal 3D printed controlling part for the A380 double-deck aircraft. Now, according to the latest announcement, the company has moved on to additive manufacturing for the newer A350 XWB family. By approval of Airbus, Liebherr is to provide the A350 XWB with 3D printed nose landing gear brackets, which will be a first for the company. 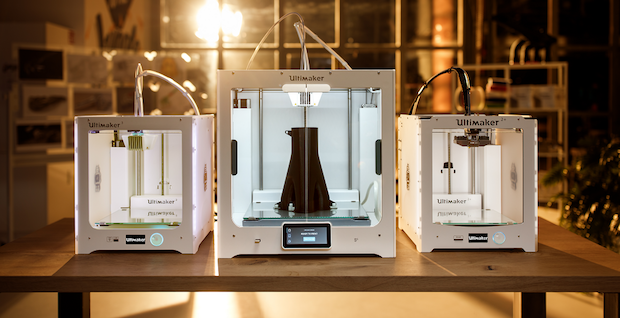 In an extension of its connections with Airbus Ultimaker is to supply the leading aerospace manufacturer with an undisclosed amount of the latest Ultimaker S5 3D printers, and “continuous access” to Ultimaker Cura. As such, the company has also achieved ISO 9001 and ISO 14001 quality and environmental management certifications. The company’s 3D printing kit will be used at Airbus in Europe for the local production of tooling, jigs and fixtures used in assembly. Previously, Ultimaker won the 2018 3D Printing Industry Automotive Application of the Year Award of the year award for its tooling efforts at Volkswagen Autoeuropa in Portugal. The Ultimaker S5 (middle), between the Ultimaker 3 (left) and Ultimaker 2+ (right). Photo via Ultimaker. Decide your Aerospace/Automotive Application of the Year in the 2019 3D Printing Industry Awards before voting opens in March. For more of the latest applications news subscribe to the 3D Printing Industry newsletter, follow us on Twitter and like us on Facebook.